What is a stakeholder and how it affects the management of personal brand or personal branding? Although he born to define investors, stakeholder Today it refers to all persons or groups affected or influenced by the activities of a company. Or even better, or interested individuals or groups influenced by the activities of a company, group and I add- independent professional. The above chart Wikipedia It is very useful for organizations with classical structures. But how the map of stakeholders of a person is drawn, work for self-employed persons? The first thing to consider is that in your Me Inc. (Tom Peters definition The Brand Called You, 1998, here translatable as I, S.L.) do you have stakeholder different internal, and instead you have key partners, mentors…, those persons or entities that will help you reach external stakeholders. 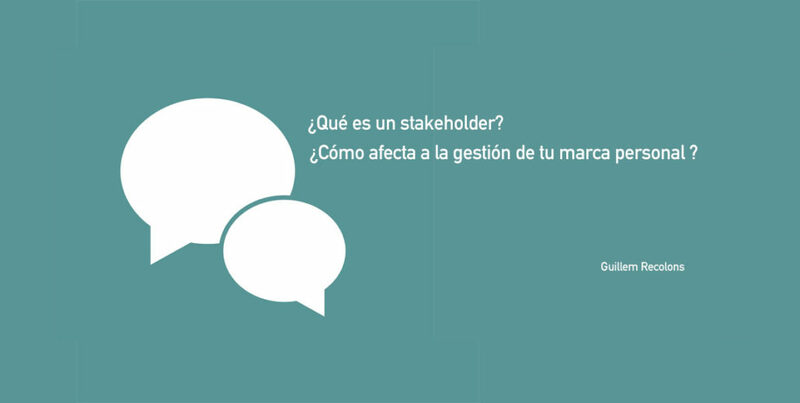 The second is that the company is you, and therefore there are differences also in the stakeholder external. 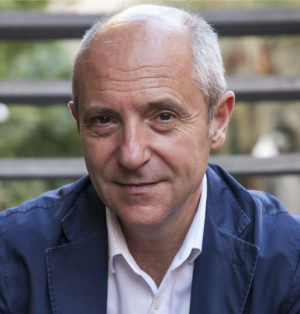 to get started, we should consider two graphs, the people with a single client (definition of Andrés Pérez Ortega of those who work for others) and people with diverse clients (entrepreneurs, autonomous, self-employed professionals in general). The following describes two graphics groups stakeholder most important personal and detailing who they are, What role do goals or in our career and where we can find them. Given the huge difference between them, it would be absurd to unify as one when crafting your message, your offer and your communication. Would you like a partner heading to a customer? Its objective: They are our beacon, a guiding light. They will do the work for you, but in early stages will help you go wrong less, and they will do based on their experience and specific skills. Where to find Them: Each type of mentor has its way of specific location. A majority will find them by direct referrals. Do not rely too much Internet search engines in such cases, as many know more about SEO than theirs. it is best to pull personal agenda and seek advice from people you trust. Best Word-Of-Mouth SEO. Who are they: It is the equivalent of a UTE (joint venture), but staff. We are in the era of the collaborative economy (Airbnb, hubs, Bicing, Co-Housing…). But what matters here is the co-working. We talk about key partners, no direct competitors (coopetidores), satisfied customers, coworkers, professional associations, guilds, cooperatives, Collaborative projects related, freelances. Its objective: lighten infrastructure, providing us skills we do not have, and where we can complement and accompany for a project. Unlike a supplier, many will make the journey with us without charging a monthly fee (results will), only putting their time and knowledge. It would be the equivalent of the departments of a company. Where to find Them: At most we find along the way. We've seen it work and we thought we could reach no partnership agreement, an agreement project. We can also find them via mentors, professional guides or W-O-M.
Who are they: Organizations willing to hire your time and skills, usually exclusively and usually full time and to integrate into a hierarchical structure. objective: Put your personal value proposition in the service of a larger project with other owners to improve the performance of an organization. Where to find Them: You find you through multiple pathways: universities, Job shuttles, companies or freelancers selection HR, social networks, Job shuttles, job portals (example: Infojobs). We also found through your own personal brand development, inbound marketing and SEO personal: you blog, Linkedin profile, activity on social networks, publications, conferences, presentations. Of course, You can also search your target companies, locate key people and initiate outreach strategies. But it is more effective to attract to push. To access the 80% hidden job market offers I recommend you read this Article. Who are they: friends, family, fellow students, ex-colleagues, friends of friends. Definitely, the closest core of trusted people who usually go in the first instance for the first consultation or assistance. objective: Give us a first trusted advice. We hit the first cable. My first work experience in an advertising agency got me my mother. There is only one, and occasionally you need to use their resources. Where to find Them: Numbers in speed dial our smartphone. In the next room…Easy. 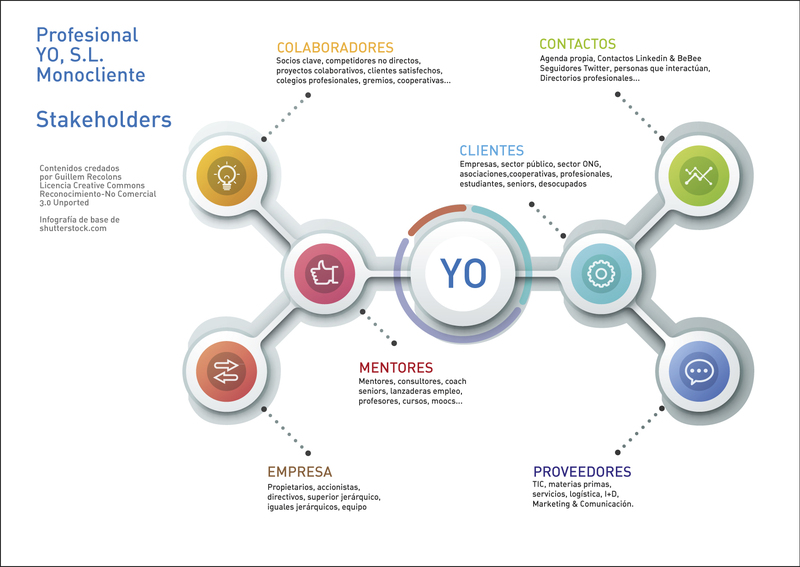 Who are they: for multiclient or freelancers, They are the ones that you will bring them pay for value: Business, public sector, ONG, associations, cooperatives, professionals, students, unemployed, seniors…. 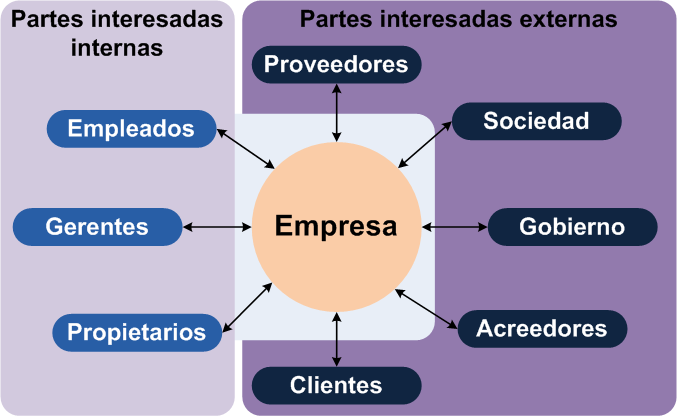 For those who work for others (monocliente) They can be internal customer (for example, for an employee RR.HH, of administration…) the external client (those who pay the company to provide value). For those who work for others, the main customer (what you pay for) is the company itself, and especially the person who decides each month continue to count on your services. objective: They are the basis of our remuneration. They are, definitely, Our main stakeholder and who guarantee us our progress and work survival. We usually devote most of our time. Who are they: Many are part of our agenda. People who have been or will at any given our real or virtual life time. They are not friends, They are hardly known or, as would Josep Pla, greated. But they can be activated and become stakeholders Quality. Should keep on hand or go find them. Most of our friends are friends. objective: If activated, They can help us reach customers more easily, providers, contributors, mentors and, definitely, the other stakeholders. They have a bridge function. If they activate us, we can also do us. Where to find Them: In the lost corners of our agenda, professional networks such as Linkedin, on Twitter lists (a feature that few use but is extremely useful), personal networks and, of course, through our personal environment. Who are they: professionals or entities that supply us return for a payment for their services or commodities. TIC, services, Logistics, I+D, shopping, Marketing and Communication, finance… Unlike collaborators, not up to our boat to help in navigation but sell us fuel. goals: We need to complete our value proposition, so that the customer experience easier. 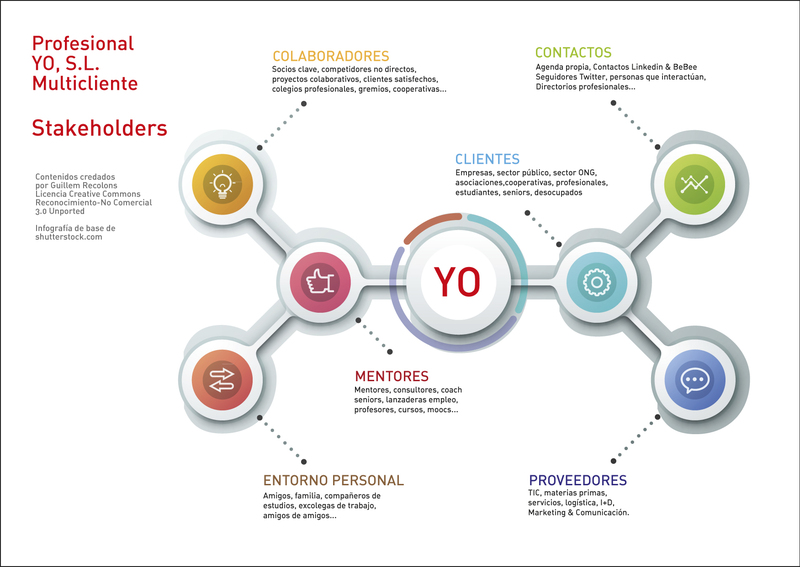 You work for self-employed persons, I hope I helped concienciarte of its importance and identify your key stakeholders, such persons or entities so important in your business model. To clarify concepts about personal branding, I leave the video What is Personal Brand? (marca personal). https://www.guillemrecolons.com/wp-content/uploads/2017/05/que-es-un-stakeholder-marca-personal-guillemrecolons.jpg 600 1191 Guillem Recolons https://www.guillemrecolons.com/wp-content/uploads/2018/07/Logo-Guillerecolons-300x240.png Guillem Recolons2017-05-14 09:12:312018-10-02 12:29:52What is a stakeholder and how it affects the management of personal brand or personal branding? true Pablo. We usually plans to customers, forgetting that there are other indispensable collective development of our brand. Thanks for write, friend! Thank you very much for the article. I did not know his blog and I'm beginning to understand better what related to personal branding. Congratulations. Aasha. Thank you for always being so generous in your references. William. Generosity is one of the brand values “Guillem Recolons”. And congratulations on your analysis.